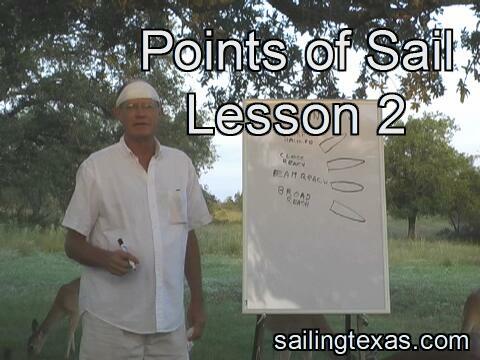 Points of Sail are the directions the hull of the boat is pointed. Very useful in communication. We normally sail on one of the 4 points of sail where we can develop full power with the sails. If we sail higher than Close Hauled, our sails start to luff and we are said to be "Pinching". If we sail higher than that, the boat stops and we are "Head to Wind" or "In Irons". The boat is pointing so much into the wind that the sails get no power. Run, if we sail lower than a Broad Reach, it is a "Run". Runs are usually slow because the wind speed drops off as we go the same direction as the wind. This change in the wind speed and direction can be pronounced, and is why most racers will not go straight downwind, but jibe back and forth instead.